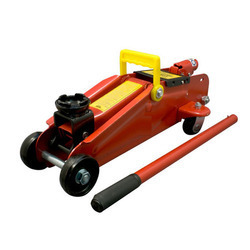 We are a leading Wholesale Trader of pit jack and hydraulic trolley jack from Hyderabad, India. To meet the diverse requirements of our clients, we are engaged in offering a wide range of Pit Jack all over the market. These products are extremely rugged in state and ensure long lasting service life. Our products are well designed that ensures their reliability and optimum strength. Moreover, our range is available in different hardness and dimensions. Our company is one of the leading companies that offer a wide range of Hydraulic Trolley Jack to meet the needs of our clients. These products are finely designed and are bought by the authentic vendors of the industry. All these products are available in different sizes and specifications as per the needs of our esteemed clients.